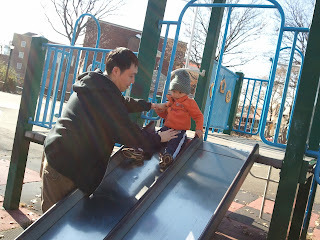 Here are some pix of the kid at the playground with my awesome big bro Ben taken in NYC. It was so nice to see everyone, including my nephews and brother/sister-in-law. We had a terrific time and celebrated with lots of family. We had some great NYC pizza ,twice, and good home-cooked food too. There were cats, lots of running around, and general kid shenanigans. What fun!